Traditional grammar defines the object in a sentence as the entity that is acted upon by the subject. There is thus a primary distinction between subjects and objects that is understood in terms of the action expressed by the verb, e.g. Tom studies grammar - Tom is the subject and grammar is the object. 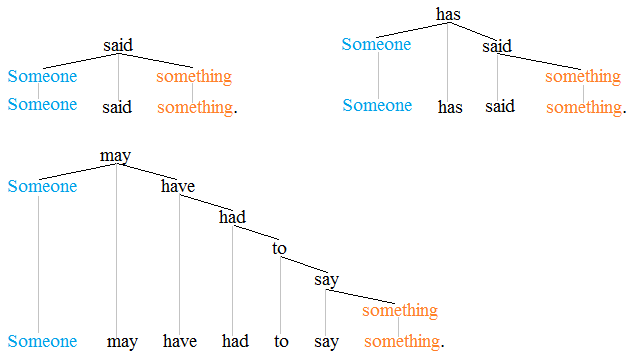 Traditional theories of sentence structure divide the simple sentence into a subject and a predicate, whereby the object is taken to be part of the predicate. Many modern theories of grammar (e.g. dependency grammars), in contrast, take the object to be a verb argument like the subject, the difference between them being mainly just their prominence; the subject is ranked higher than the object and is thus more prominent. Prepositional object Object introduced by a preposition She is waiting for Tommy. The descriptions "entity acted upon" and "entity indirectly affected by the action" are merely loose orientation points. Beyond basic examples such as those provided in the table, these orientation points are not much help when the goal is to determine whether a given object should be viewed as direct or indirect. One rule of thumb for English, however, is that an indirect object is not present unless a direct object is also present. A prepositional object is one that is introduced by a preposition. Despite the difficulties with the traditional nomenclature, the terms direct object and indirect object are widespread. A number of criteria can be employed for identifying objects, e.g. a. A book was given (to) me. - Passive sentence identifies a book as an object in the starting sentence. b. I was given a book. - Passive sentence identifies me as an object in the starting sentence. The second criterion is also a reliable criterion for isolating languages such as English, since the relatively strict word order of English usually positions the object after the verb(s) in declarative sentences. The third criterion is less applicable to English, though, since English lacks morphological case, exceptions being the personal pronouns (I/me, he/him, she/her, they/them). For languages that have case and thus freer word order, morphological case is the most readily available criterion for identifying objects. In Latin and related languages, direct objects are usually marked with the accusative case, and indirect objects with the dative case. Note as well that some objects are marked in telling ways in particular languages. In Spanish, for example, human objects have to be marked by the preposition a; the phenomenon is called differential object marking. ↑ The division of the clause into a subject and a predicate is a view of sentence structure that is adopted by most grammars, e.g. Conner (1968:43), Freeborn (1995:121), and Biber et al. (1999:122). ↑ Concerning the fact that the object is part of the predicate, see for instance Biber et al. (1999:122). ↑ The insight that the arguments and adjuncts of verbs are ranked is expressed as the Accessibility Hierarchy. See Keenan and Comrie (1977). ↑ The distinction between transitive and intransitive verbs is acknowledged by most any grammar. See for instance the Collins Cobuild Grammar (1995:139ff.). ↑ Concerning the historical distinction between direct and indirect objects, see Conner (1968:108f.). ↑ Biber et al. (1999), for instance, use the term oblique object to denote an object that is introduced by a preposition. ↑ See Biber et al. (1999:126) for a similar list of characteristics that identify (direct) objects. ↑ Concerning the passive as a diagnostic for identifying objects, see for instance Freeborn (1995:175) and Biber et al. (1999:126). ↑ For a classification of transitive verbs along the lines used here but using different terminology, see for instance Conner (1968:103ff.). ↑ Concerning ergative verbs, see for instance the Collins Cobuild English Grammar (1995:155f.) and Biber et al. (1999:155f.). ↑ The term object-deletion verb is adopted from Biber et al. (1999:147). Such verbs are also called ambitransitive. ↑ Dependency trees similar to the ones produced here can be found in Ágel et al. (2003/6). Keenan, E. and B. Comrie 1977. Noun phrase accessibility and universal grammar. Linguistic Inquiry 8. 63-99.